My paintings are formal reconstructions of real experiences and could be seen as equivalents for the circumstances in which they originated. 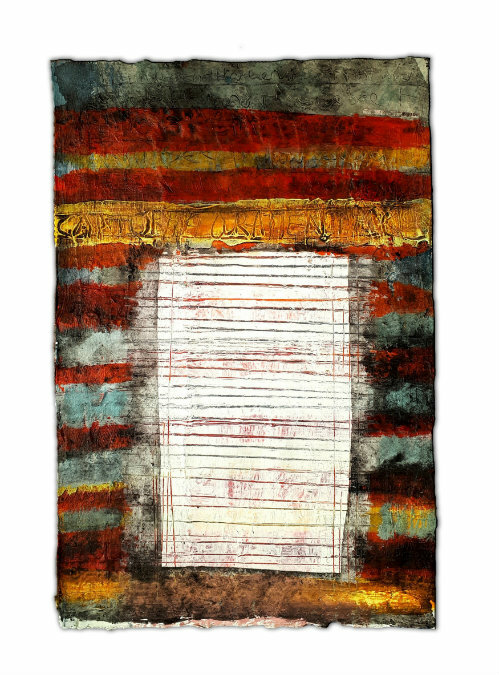 I use crooked squares, single images handwritten notes, and spontaneous marks as tools in my work to engage the viewer. I am concerned with the physicalities of paint, a sense of place and wonder, and how to convey this. These particular paintings are the result of four years of looking at a simple field and an independent tree on the outskirts of my hometown. I have a tendency to isolate certain images and by doing this highlight the ordinary beauty that surrounds us all. All things can be found in these field and tree paintings. There is life, death, renewal and an element of protecting the history of both. In a way, they are like portraits of something caught in a glimpse. The tree paintings are of one tree, separated from the rest on a hill top. It acts like a sentry, overlooking the community, protecting it like a guardian. The ‘Streetheads’ connect the rural with the hustle of urban living. I would use handwritten notes in the work and these lines can flicker in and out of visibility, emerging from and then vanishing beneath layers of paint. Some of these ‘notes’ are addressed to the viewer while others are more like my own mutterings. Each work would be similar to single frames that have ended up on the editing floor. I have taken these and given them a new lease of life. I hope that this work has a new life and that when viewed they awaken themselves and the viewer. It is a collaboration between both. 2006 “Portals and Vessels” Origin Gallery, Dublin. Purple Onion Gallery - Summer Exhibition Group Show. 2008 Claremorris Gallery - Group Show with John Shinnors, Donal Teskey. Shane Cullen Inner City Project. Ireland and England – Monaghan County Council – Monaghan V.E.C. Join the mailing list to keep informed with all the latest news from McKenna Gallery.